Whether you are needing exfoliation, hydration, or detoxifying effects, you will feel as though you are in the lap of luxury while receiving any of our customized body treatments. We will customize the perfect treatment just for you! During the treatment your body is wrapped in warmed glacial clay & Pacific seaweed to allow vital nutrients and minerals to infuse which work to purify and re-balance. During the wrap, ailments and conditions are addressed including inflammation, muscle/joint pain, and toxins are effectively eliminated through the lymphatic system. Your treatment is completed with an application of luscious seaweed infused body butter and hydrating mist to seal in moisture and leave skin ultra smooth. This unique salt exfoliation is unlike any other! It infuses the skin with the benefits of green tea, Pacific Seaweed and pure therapeutic grade essential oils. Fine grain salt crystals offer effective yet gentle exfoliation and work to offer detoxification and re-balancing. The treatment is complete with application of a nourishing seaweed butter and hydrating glacial mist. Receive advanced anti-aging corrective care to target signs of age caused from exposure to harsh environmental factors. During the treatment your skin will be gently exfoliated and wrapped with our Acai Whipped Body Polish and a silky Acai Anti-Oxidant moisturizing cream is massaged all over the body to restore moisture levels and offer skin renewal and repair. Ideal for dry and mature skin types. Enjoy aroma steam prior to your rub followed by a wrap – both specifically designed for you. 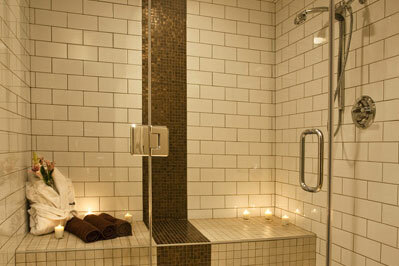 Start your body treatment in our aroma steam room. For best results we recommend an exfoliation treatment prior to your thermal body wrap. Enjoy!